Will resume shipping around 1/31/2017. 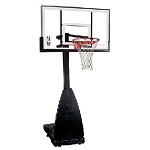 Spalding Portable Basketball Goals - 68562 Features a 60 inch Acrylic Backboard. 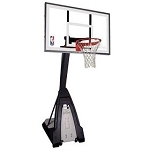 Spalding 68562 portable basketball system features a large 60 inch acrylic backboard. With this system, you get a large goal with many of the bells and whistles of a high end system without a -high-end price. 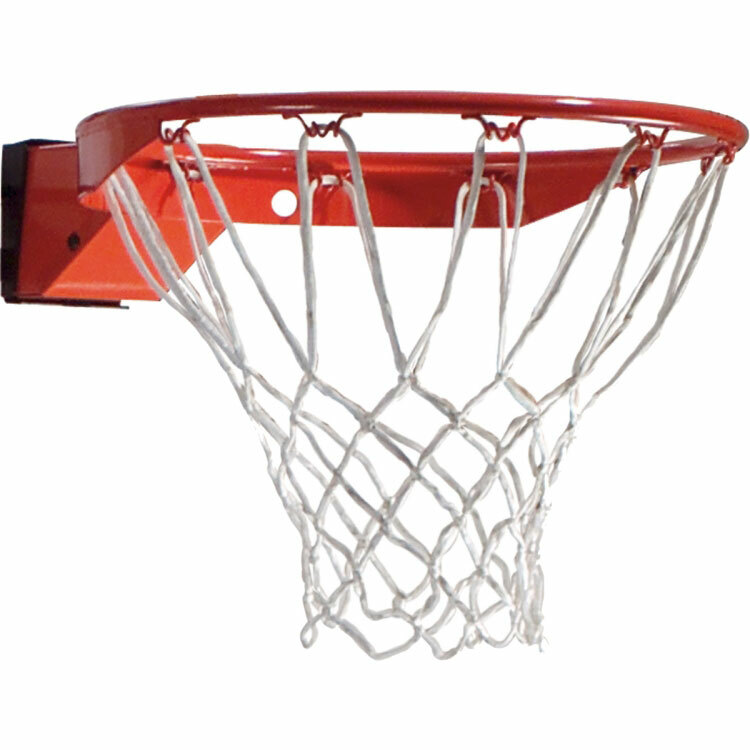 This unit comes with an arena slam breakaway rim with an all-weather net. You also get a large 3.5 inch diameter round pole with this goal system, which is much sturdier than comparable 2.75 inch and 3.0 inch poles. 60 inch acrylic backboard, just 12" short of regulation size. Acrylic material is 3/16 inch thick. Backboard design provides about 16 inches of clearance between the system and backboard. Backboard framed with a steel support. 3-piece, 3.5 inch round pole. Pole angles at 20 degrees from the base. 40 gallon portable base capacity can be filled with either water or sand. Portable base dimensions: 55 inches L x 33 inches W x 6 inches H.
Pole made out of steel. 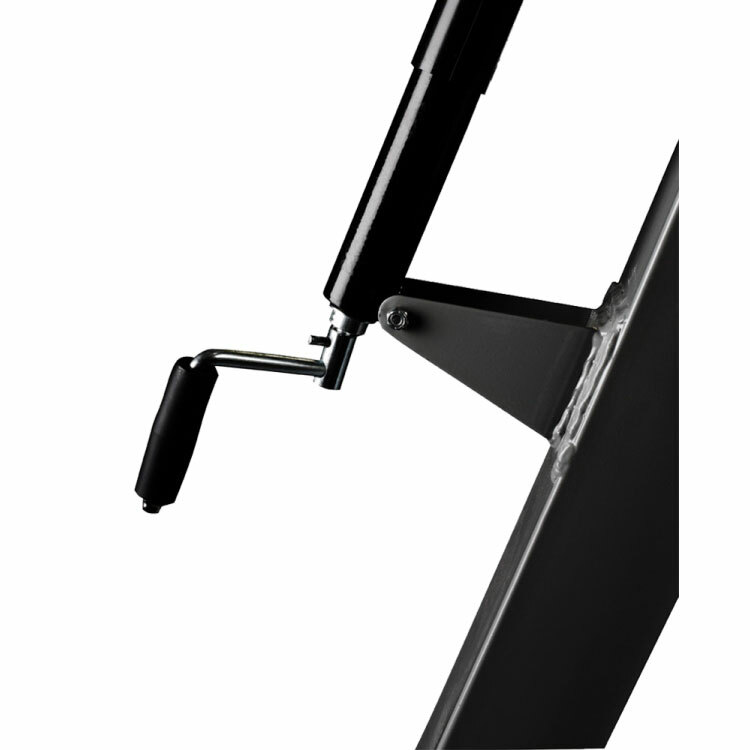 Screw Jack Lift system allows you to adjust the rim height from 7.5 ft. to 10 ft. with infinite increments in between. Screw Jack handle is removable. Steel parts are powder coated to help resist rusting. Comes with a factory honored warranty. Portable base uses 2 wheels to move the product around. Product Packaging Dimensions: 61.50" x 38.00" x 16.75". This product is typically shipped via an LTL carrier for a curbside delivery. If this is the case, the carrier will bring it to your address and require assistance unloading the product. If the order ships via FedEx, the package will be left on your door step. Competitive Edge Products is an authorized reseller of Spalding basketball products. 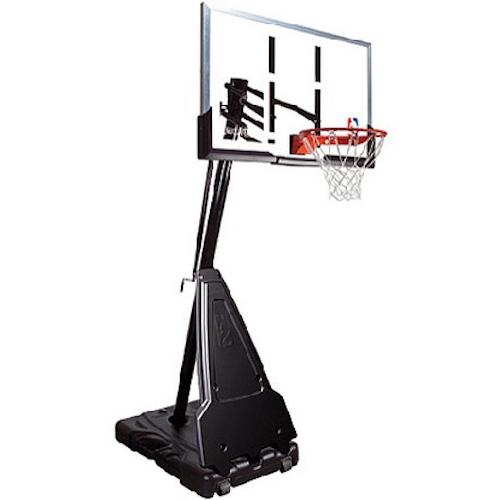 If you find the 68562 portable basketball goal for cheaper anywhere else online, please let us know. We will try to match or beat their advertised price (price of the product + any shipping). Q: Do you sell just the backboard? My 60 inch BB broke. Q: What are the dimensions of the base? A: Portable base dimensions: 55 inches L x 33 inches W x 6 inches H.
Q: Do you have item on hand and can ship fast? A: These items usually leave here the next business day. Shipping to your location can take about a week to ten days to arrive. Often it arrives sooner, but we cannot guarantee any specific delivery dates. Tracking will be automatically emailed to you as soon as it ships out. Feel free to contact us with any questions. Q: How much does the base hold? A: The base holds 40 gallons of sand or water. Q: How much water does the base hold? Q: My glass on the backboard shattered I need a replacement will it be able to be replaced? A: Yes, for a replacement please call 800-558-5234. Q: Is there one big box when it is shipped or is It many small boxes? A: It ships in several boxes on one pallet. It is too large for FedEx or UPS and the freight carrier calls you a day or so in advance to set up a delivery appointment. Q: Can a child adjust this up and down or is it too difficult? A: It is very simple to adjust and most children can adjust it. The manufacturer does recommend an adult to supervise the child while adjusting it, but around the age of 8 years old can generally adjust this. Q: Does this wobble when you use it? I'm looking for something that's very sturdy. A: It is very sturdy. Any portable system (with a plastic base) does have a little bit of movement. Also, any system that has moving parts to adjust up-and-down has a little bit of movement as well. It is definitely on the high-end of stability for portable basketball systems. Q: What is the warranty from the manufacturer? A: The warranty is 5 years on acrylic backboards, and one year on the pole, rim, and base. Fast Shipping: Orders for the 68562 Spalding Portable Goal generally leave the warehouse the next business day. Delivery Details: This product ships directly from Alexander City, Alabama. Delivery of this product is via a curbside delivery through an LTL carrier (too big for UPS and FedEx). The customer must be present to sign for the order. The freight carrier is instructed to contact you prior to delivery to set up a delivery appointment. Local Pickup Option: This item is available for local pickup in Alexander City Alabama. If you are interested in picking it up locally contact our customer service for a special pickup quote at 866-308-5484. Dimensions: 62" x 38" x 17"